The purpose of this project is to find a solution to help the rehabilitation of people with damaged vestibular systems which affect their sense of balance. 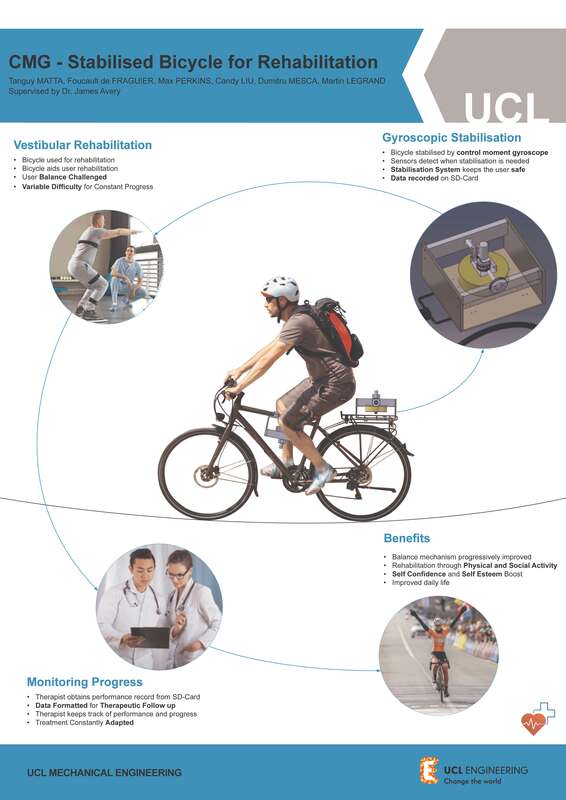 The main aims are to design from scratch a system which can stabilise a bicycle and is adaptable to different riders. We also want to offer a range of exercises which can further aid rehabilitation, measure the user’s performance and track their progress. Our aims were achieved through the design, development and manufacturing of a Control Moment Gyroscope (CMG). By implementing this system on a scooter, we established a proof of concept that could be scaled up to the size of a bicycle. A casing to house the CMG, a control system to regulate it and a user interface to parameter it were designed. By liaising with vestibular rehabilitation experts, exercises were developed and tailored to patients’ needs. Results obtained show the viability of this system and leave room for future improvements.